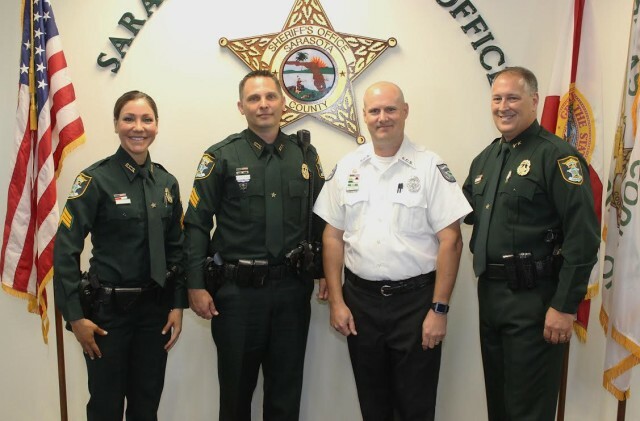 On Nov. 5, Sarasota County Sheriff Tom Knight promoted three employees to new positions in the Law Enforcement Division and Emergency Operations Bureau, the Sheriff’s Office has announced. Det. Michelle DiCapua, who is assigned to the Patrol Bureau, was promoted to sergeant, a news release says. She began her career as a deputy in January 2005, the release notes. In 2009, she obtained her Instructor Techniques Certification and began teaching defensive tactics at the Criminal Justice Academy. For the past five years, the release notes, she has worked in the Special Investigations Section. DiCapua ranked first on the sergeant’s promotional exam, the release adds. Det. Scott Huber also was promoted to sergeant, assigned to the Patrol Bureau. He was hired by the Sarasota County Sheriff’s Office in March 2000, the release says, but he left in 2003 to attend Officer Candidate School with the United States Coast Guard. After more than three years of active duty, assigned to an anti-terrorism team, he returned to the Sheriff’s Office in 2006, the release continues. Huber has worked in the Special Investigation Section since 2008. 911 Systems Analyst Brett Thomas was promoted to operations supervisor, assigned to the Technical Services Section of the Emergency Operations Bureau, the release adds. After leaving the United States Army in 1992, Thomas was hired by the Sheriff’s office as a communications operator, the release says. He became an equipment technician in 2002.